There's a well-known expression, 'too many cooks in the kitchen' – it suggests that maybe a collective gathering of chefs would see things getting a little hot in there. Well, we know our chefs, and know that they're a happy bunch. But in the interest of keeping things sweet, we met in someone else’s kitchen for our most recent chef brainstorming day. Namely, Hugh Fearnley-Whittingstall's River Cottage HQ. The food experience at our hotels has changed a lot over the years, keeping pace with trends, how people dine and what they like to eat. It's really important to us that our chefs get the opportunity to get together and work collaboratively to share knowledge and bounce ideas off each other. Across the hotels we've noticed an increasing demand for vegetarian and vegan dishes, and so collectively our chefs were excited about making something that used to be a side dish the star of the show – veg is having its moment. 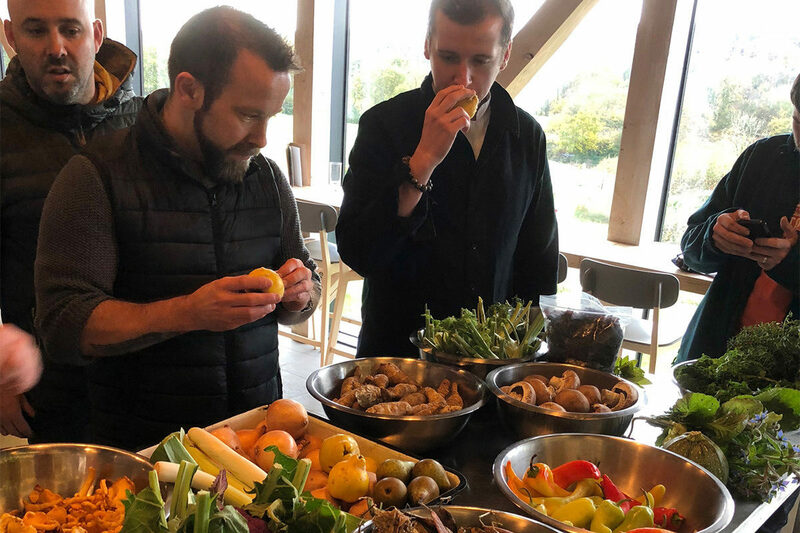 The visit to River Cottage HQ had a focus on discovering more plant-based dishes; the day began with a walk around the kitchen garden picking a colourful selection of seasonal vegetables, beautiful squashes, beetroot, leeks, kale and herbs. Returning to the kitchen, the River Cottage team shared their ideas with our chefs, who then set about creating some really stunning dishes using the best of the seasonal vegetables they'd collected. It was an inspiring morning that resulted in some really stunning dishes showcasing a variety of skills, flavours and cuisine. After a good lunch, the afternoon session was a complete contrast to the skills used in the morning, focused on creating wholesome and rustic meat-filled pies! The River Cottage team let our chefs loose with their imagination to create some savoury wonders and great pastry. Our chefs had a really great day. It demonstrated the importance of having time out of their own kitchens to share challenges, knowledge, learn some new skills and have some fun at the same time. Huge thanks to the River Cottage HQ team for letting us bring even more chefs into your kitchen. Our Chefs: George from The Ickworth, Jethro from Woolley Grange, Mike from Moonfleet Manor, Piotr from New Park Manor and Wes from Fowey Hall.